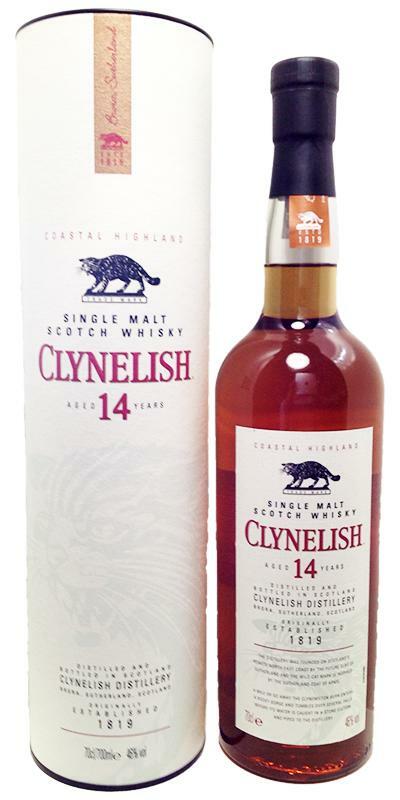 Known for its waxiness, Clynelish 14 is a Highland Single Malt primarily matured in ex-bourbon casks. Scotch mist gives an indication that it is non-chill filtered. Creamy honey, candle wax and lemon juice are prominent on the nose, while rich floral notes with a hint of peppermint lurk in the background. The arrival is warming and aromatic, unfolding a distinctly dry and oily character. Oak bitterness with a touch of salt dominates the medium-length finish. Altogether, it is an engaging and intense malt that requires time and is not suitable as everyday dram. Quite surprised by this standard that I had circled around for some time. Tastings have positive effects, especially on this one;-) Give it a try - a nice bang for your buck bottling. The constantly available bottling of the Highland distillery Clynelish - one of the best standard bottlings in this price range - a really good malt! Definitely has character, very interesting mix of sweet and maritime. Find it very well matched and is a top malt for me. Aroma: vanilla, overripe rotten pears, honey, blooming lilac, minerality, granite in the sun, fresh white bread broken in half. Taste: honey, honeycomb, orange peel, spicy, oily. Aftertaste: repeats the taste, honey, wax, a little pepper, on the tongue you directly feel the film of butter, rather long. Conclusion: a very good representative of the Highland with a wonderful fortress (in Diageo this is the only official release that crossed the threshold of 46%) which adds integrity. Molt is very strict, without excessive sugaryness, even though honey is in the first place everywhere, in general, Highland, which I love. There are not very many nuances, more in flavor, but everything is very consistent and consistent. spicy on the tongue, but a creamy mouthfeel. A really nice highland malt. A solid whisky, really nice.